Celluma Pro is a 3-in-1 Panel Device for Acne, Anti-Aging and Pain. NASA technology - Inspired by light, proven by science. Get radiant, clear, tighter skin with Celluma. Blue Light: Celluma light therapy works safely and effectively, without abrasive chemicals, harmful UV-rays or side effects, to destroy acne-causing bacteria – not only clearing up existing blemishes, but preventing future breakouts before they happen. Near IR: Specific and discrete, deeply penetrating wavelengths of light energy decrease inflammation and increase micro-circulation to decrease arthritic and joint pain, muscle spasm, and muscle and joint stiffness. For almost all conditions – skin or pain a 2x/week for 4-10 week protocol is recommended. Patients with pain often experience some, and occasionally full relief, following only one treatment. However, it's safe to use daily, or multiple times a day on different body parts, if desired. All three Celluma programs (acne, wrinkles and pain) are designed to deliver a full therapeutic dose of energy in 30 minutes, so, for better/faster results we recommend using for the full 30 minutes whenever possible. LED light therapy is pain free and non-invasive. The light energy helps tissue heal naturally from the inside out. Think of it as a 30-minute power nap with benefits. No downtime! We request that all make-up be removed prior to treatment as there should not be a barrier between skin and light energy. Use sunscreen everyday to prevent further skin damage. Celluma is quite unlike any other low-level light therapy device available today. It is widely used by wellness practitioners, cryo clinics and skin specialists to treat a variety of musculoskeletal and skin conditions. 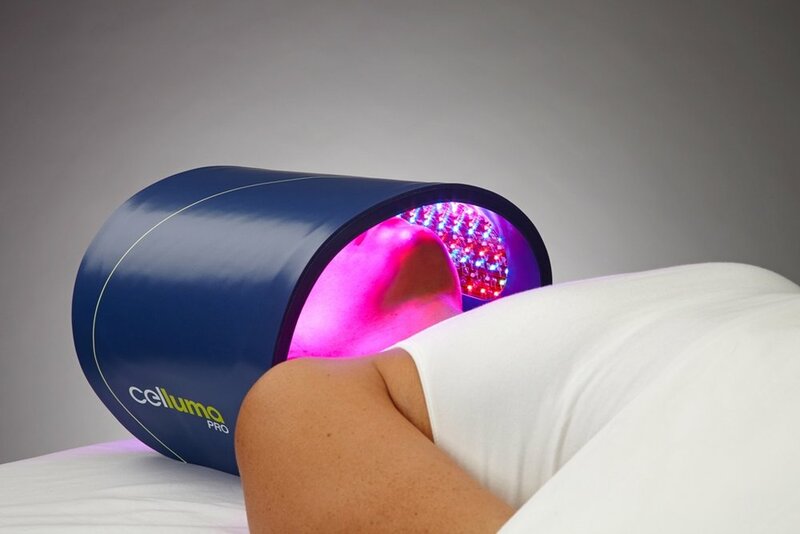 Based on scientific research pioneered by NASA, the Celluma is a specialized light energy device FDA Cleared to treat: Wrinkles, Inflammatory Acne Vulgaris, Diminished Local Blood Circulation, Muscle & Joint Stiffness, Muscle Tissue Tension, Muscle & Joint Pain, Muscle Spasm, and Arthritis. Celluma is also CE Certified in the European Union as a Dermal Wound Healing device. In a nutshell Celluma helps comprised cells regenerate. Specific wavelengths of light energy, when properly absorbed, up-regulates compromised cells. The light (photons) energy is absorbed by photoacceptors in the mitochondria and used to create adenosine triphosphate (ATP). The ATP produced then stimulates various metabolic processes which can result in the repair and regeneration of cell and tissue components.